Best 3 Games with…Area Control! “Dudes on a Map” is what they call it. Where you get to puff your chest out and go head to head over an area of a board….last man standing….kinda! I have always avoided area control games due to their general use of luck based combat involving dice. Randomness ruined it for me. Now when I see a map of different territories, it is an immediate turn off for me. I have now come to a realization that Area Control doesn’t necessarily need to be luck based. It doesn’t even need to be combat driven. These games, I feel, do the best job when it comes to controlling a specific area for a specific reason and how that fits into the overall game. 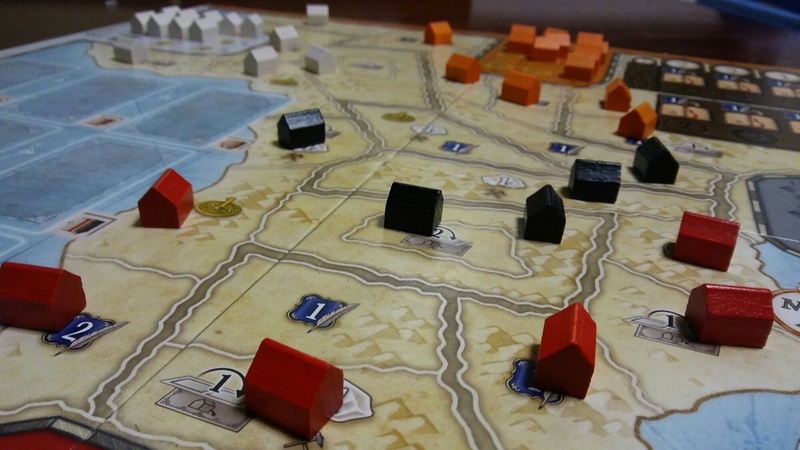 Many times when talking about Area Control, that is the main focus of the game. Very few times is it an after thought. Unlike, deck building that can be a small mechanism in a greater game, area control tends to be the main mechanism with others as a main focus. Anyway, let’s get to the Best 3 Games with…Area Control! 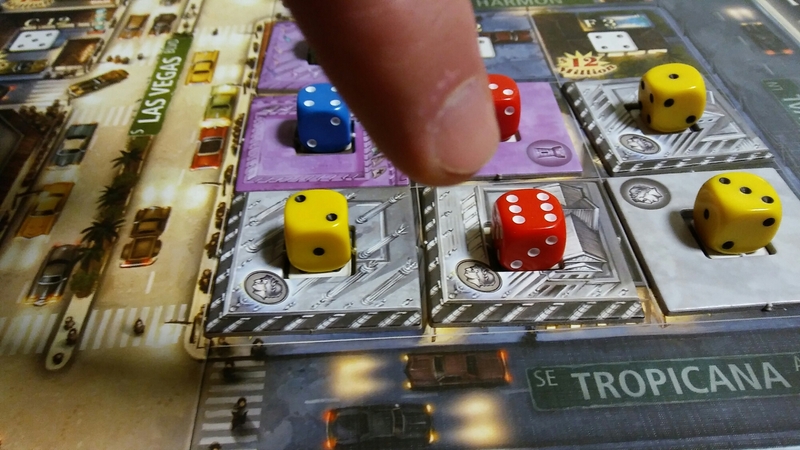 Okay, I said at the beginning of this post that randomness is one of the reasons I don’t like area control….but with Lords of Vegas, the randomness doesn’t bother me……at all…..because it is all random. Okay, not all of it but 75% of it is just random goodness, so it is hard to take it very serious. The great thing about the area control aspect of this game is that it can change in a heart beat and because of nothing or everything that you did. The goal is to have the highest valued die in the casino. It doesn’t matter if you only have one die and another player has eight….as long as your die value is highest, you own that casino and therefore can make most of the decisions for that specific casino. The strategy comes with the actions. Changing the color of the casino and expanding the casino are just a couple things to do. The fun part is when anyone that owns part of the casino can pay to reroll ALL the dice that are part of that casino, changing ownership immediately…hopefully! The Area Control mechanism designed by James Ernest and Mike Selinker in Lords of Vegas is just fun, lighthearted, random goodness! Everything Alexander Pfister does, seems to resonate with me. I really enjoy Great Western Trail, but Mombasa is my true love. There are so many great mechanisms in this game that just all blend so well together. This is one of those rare games that the Area Control is not the end all be all…..does it help? Absolutely! Is it absolutely necessary? Maybe not? The Area Control part of Mombasa is unique in the fact that not one player is directly connected to a specific company. Anyone can effect any company at any time. Most of the time, it does work out that each player is focusing on specific companies, but you could just piggy back off of other players letting them do all your dirty work. I absolutely love this aspect of the game. The more of a company is out on the map, the more valuable it is at the end of the game, giving more points. It’s not very wise to only focus on one company, putting all your eggs in one basket. I love the interaction between players and seeing who is helping others out. Where to start??? The brilliance of this game, by Chad Jensen, shines throughout! It is a worker placement game in the veins but the Area Control is the heart that gives it life. There are two different ways to gain “Control” of each “Area” in Dominant Species. The first way is the old fashioned way, have more cubes on an area than the other players. This gives you points…..this gives you the things that give you victory. BUT the other Area Control aspect dictates how easy that is going to be. The other way to control an area is to be able to survive in an area the best by having food tokens on it that your species can use, that has nothing to do with how many cubes are there. If you have 2 food icons on your player mat that match 4 food tokens on the land, that is worth 8. Someone else might have 4 cubes but only one matching token on their player mat for only 1. He will get the most points but you will have Dominance, which allows you to get a Dominance Card that are extremely powerful and change the game either in your favor or in anothers. The ideal situation is to have both most cubes and dominance, but often times, depending on what cards are available, having dominance is more important than a handful of points. The points are nice but those cards are brutal and if you don’t use them someone else will….and it just might really hurt you! It will be some time before a game overtakes this one when it comes to strictly Area Control. The number of cubes (species) has no influence in Dominance, the matching tokens is the only criterion. If you have 2 worms and there are 4 worms on the tile, that is worth 8, the number of cubes is irrelevant, as long as you have at least one cube in the tile. Agreed…..I will fix it! Thanks for the heads up. I played a few games of Dominant Species a while back. It’s an intense game. One of those that leaves you exhausted. I enjoyed it but it’s work.